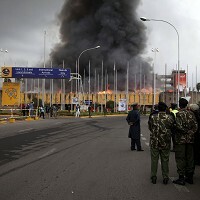 Kenya's main international airport has been forced to close its arrivals area following an early morning blaze. All in-bound flights to Jomo Kenyatta International Airport have been re-routed and black smoke was seen to be spreading across much of Nairobi as fire teams tackled the inferno. Passengers in the fire-damaged arrivals area were evacuated and left stranded outside the airport with their bags beside them following the incident at 5am on Wednesday. Reports say the area where passengers pass through immigration and collect their luggage has been severely damaged. No injuries have been reported and flights due to arrive at the busy airport have been diverted to Mombasa, Michael Kamau, the cabinet secretary for transport and infrastructure, said. The incident reinforces the importance of comprehensive travel insurance for anyone planning a trip overseas. The closure is to allow firefighters to get the blaze under control, Kenya Airports Authority said. No notice has been given on when it is thought the airport will reopen. The cause of the fire is not yet known and Kenya's anti-terror police chief, Boniface Mwaniki, said a full inspection would be carried out once the blaze has been extinguished. Until then, no judgement or speculation will be made, he added. A British passenger, Martyn Collbeck, said: "When I arrived there were one or two fire engines parked outside the international arrivals. It spread very fast. "There were a couple of explosions which I think were a couple of gas canisters. I would have expected more fire engines to respond faster."